Playing a pokie machine or any slot machine for that matter is a very simple case of inserting some money via the coin or note acceptor and then interacting with the game via a range of buttons which are found in most cases on a level section just below the game screen. There are no tricks or secret combinations that will give you a better chance of winning. Read our How Pokies Work article to find out what happens every time you spin the reels. Below we have a simple diagram of one of the most common button layouts. While not all games will have the buttons in exactly the same order or have the same buttons they tend to all be very similar. Below the image we outline what all the buttons do and show you how to use them. Press the collect button to take your money out of the machine. This will either activate the coin drop from the hopper or display a call attendant message in which case the win will be paid by a gaming employee. The next five buttons all relate to the amount of credits bet per line. Once pressed they remain active until another choice is made. Four of the buttons also have a role in the gamble feature. The card suits on displayed above indicate which button should be pressed to select that suit. The first button on the bottom row has two features. The first is the Take Win feature. Press this to take your win from the gamble feature or to stop the win amount accumulating and display the final win total. The second feature is Reserve. Pressing this button reserves the machine for a total of three minutes. This feature is only found in pubs and clubs. The next five buttons all relate to the amount of lines per spin. It is important to note that pressing any of the five buttons will start the reels spinning - there is no special spin button on pokies. The first and last button of the five are also used in the gamble feature and can choose red or black. Next up we have the Gamble button and the Start Feature button. At the end of any winning spin you can press the gamble button to be taken to the double up bonus game. In some cases pressing the Gamble button subsequent times will offer a half gamble option. The Start Feature button only becomes active when the bonus feature is won and starts the game. Now you know what the buttons do you have to know how to use them. Once you have money in the machine you have to select your bet per line before you select the amount of lines you will bet on. This is because all of the line bet buttons will activate the game and start spinning the reels. 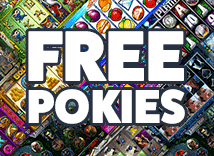 Online pokies tend to have a different set of buttons compared to offline pokies which can also vary from game to game and from casino to casino. The principals from the offline games are the same in the fact that you have to select a bet level and then start the reels spinning. Credit Size - Changes the credit size. For example 1c to 2c. Credits Per Line - Adds or subtracts one credit per line. Spin - Starts the game with the current bet level and credit size. Max Bet - Bets the maximum amount of credits and starts a spin. Some of the buttons only appear at certain times. For example often the Gamble button will not appear until you have a win that you can gamble and the Start Feature button might not show up until you win the feature.